I agree. The X1 font is too small. Customers should have a font size setting option. Thanks for reaching out to us regarding this issue. I have added your request to my report. Add me to the list of people that wants to be able to adjust font size. I am thrilled to see more and more customers posting the need to be able to adjust the font after all the negative pushback I have received over the past few months. Those of you who are happy and have beat me to death over this need PLEASE don't go over why we don't need to be able to adjust again. I just had to comment on the increase in user input. Makes me smile. She's baaaccckk !!!! Just kidding TerriB !! How you doing?? Hi Fred, have been trying to hold myself back but just could not resist. The ole horse is not being beat again....lol. But if Brandon is still compiling his report, the return of guide font size adjustability is at least months away if not more. My concern is how serious Comcast is about this issue. What will happen if guide software gets off the cloud and back on the box? What will happen if Comcast's talks with TiVo move further. Personally, I think Comcast has too much goin on (in comparison to the resources they are willing to devote to X1) to take the guide font size issue seriously. I hope I am wrong but I don't think I am. Rick, At this point I am just glad that someone in Comcast is compiling information for the font adjustment even if it takes a while. If you go TIVO does it 'fit' with Comcast ? I don't know much about it except that you pay monthly. I think Shane knows more about the monthly charges than I do. I know he will be paying a bit less per month overall. You need to pay subscription fees to TiVo but you get to remove DVR, HD box and AnyRoom charges for your Comcast bill. You need to add CableCARD charges to your Comcast bill. By the time it is all said and done, I believe your total monthly bill is slightly less having TiVo DVRs. You still need to deal with Comcast in regards to CableCARDs and the programming package you are on. Comcast still gets a lions share of your money, but at least you own your DVRs and every review I have read says TiVo still has the best DVR out there. They should...TiVo holds many important DVR patents which some forum members believe has Comcast's hands tied when it comes to X1. By switching over to TiVo, you certainly are not leaving Comcast. You are just leaving their DVR and cable box service. I wish you and Shane good luck with the Tivo. You were actually already on my report. My report has a good amount of information on it, and I will be emailing it out to my Accessability Supervisor today. I'll post back when I hear something! Hey now....watch the 'real tv' crack!. I felt a strong yank on my chain as only you can! I don't have a need for Tivo and my large screen SD set is as real as it gets. When it takes a dirt nap we will upgrade. Comcast DVR takes care of our needs except for the quirks with recordings and so forth. We can record all we need/want on one DVR. Yes dear I got such a kick out of it I wanted to kick you......lol. We have learned so much about each other on here haven't we? I remember checking out Tivo when I bought this tv and loved the idea since we didn't have DVRs back then but didn't want to pay the monthly charges. We all have to get/use what works best for us. I have the opposite problem. My x1 was reset last night and now the font in the guide is massive! To the point where I can only view one hour at at time. Has anyone encountered this and is there a way to fix? I want to add something here. As some of you know I have Tivo along side my x1. 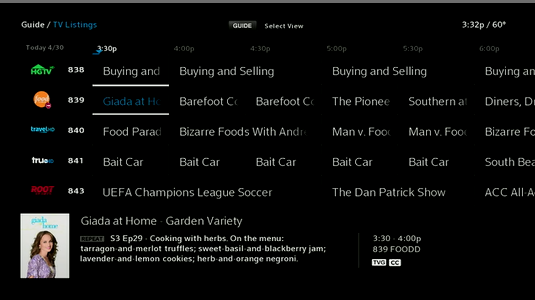 I can see the tivo text much better than the x1. I have measured the size and boldness and size of the text( in case you ask I used a micrometer on my 160" screen). The difference is the font is white on blue( really close to the legacy blue).So maybe there is something with the white on black issue! I have to assume your tongue is in your cheek and you are yanking chains. No one else has reported this and Comcast has done nothing to allow us to adjust nor have they changed the font. What version are you on now? I would be thrilled to have to scroll to see more than one line at a time IF IT MEANT I COULD READ THE GUIDEAND PROGRAM INFO. OMG Shane, you actually are coming round to my way of thinking that it may be all about the contrast??? What is with the new poster saying they have HUGE FONT????? I assume you are kidding??? No one else has reported this and Comcast has done nothing to allow us to adjust the tiny font. What version are you on now? I would be thrilled to have to scroll to see more than one line at a time IF IT MEANT I COULD READ THE GUIDE. terri they are having the ZOOM in bug that everyone was getting last week! WHEW...thanks for clearing that up. I was ready to put a noose around my neck. Yes I have always thought this, it just took me getting tivo to confirm this. Here is a link a want you to check out! We must stop using the subject that says Font too Large now that we know its the zoom bug. Just having the words Font too Large is the worst thing in the world for Comcast to see being posted. We will NEVER get them to allow us to adjust . Here is a better link which shows the guide better. just so you know they show what they call the live guide, but it also has the traditional grid style guide as well. DISCLAIMER: This link is placed here to show the difference in color contrast, not to endorse Tivo! In saying that I hope you understand the slight topic change! I am not amused by the change of topic from small font size to large font size. If you don't have the problem, lucky you! Stop interferring, go away and let the rest of us try to get Comcast to pay attention to a real problem. Personally I don't think Comcast is taking this issue seriously and I HIGHLY doubt that guide font size adjustment will return. I believe that those of you waiting for this are going to be waiting for a very long time. I suggest you go back to legacy boxes or change over to TiVo. Pizza gotta love your sense of humor. You never cease to amaze me....roll on. Terri good luck with the font battle...Maybe it is time to drive to philly! My little 4 tuner Romio I has given zero issues so far. There are still issues with the 6 tuners especially it seems with the cable cards. And it's not limited to Comcast. I can get to their Regional HQ in Manassas, Va in 15 minutes! Thats where that senior citizen lady who made the national news a couple of years ago took her equipment and slammed it on a corporate officer's desk. They arrested her but she got what she wanted. She became my hero. The issue exist with time Warner customers as well. for some reason the cards get flaky after the 6th tuner is used..Most are able to use 5 of of 6 with the tivo. Please include my wife and I regarding the guide font size issue. We have a 40 inch led that has excellent resolution. Thank you for getting rid of outdated threads..Now maybe I will wake up to only 30 emails not 60!!! You can fix that in your forum preferances..... I did mine!!!! on version 04e the text in the guide appears 'white' until you highlight it (changes to blue) then navigate off and it becomes nearly black dark gray on black). what happened? Earlier today I watched the Formula 1 Brazilian Grand Prix with a very good friend that just last week switched from DirecTV to X1. Changed background.....fonts still too small, We are getting frustrated....also, phone call listings are too small....have to get up; and see who's calling! We lose picture at times and the remote is hard to read....give me my old service back....or fix it! Add me to the list also. I cannot read the guide on a smaller TV from across the room. I would love to be able to adjust the font. I too am still having issues with this. I have tried to selfsource the solution, but seee that the font size for the X1 is a real chore. Some additional items that I found I didn't like with the X1 box, was that the groupings from the old xfinity boxes are no longer available on the new. Though I will eventually learn the new, I miss some of my prior items.